Another Icelandic volcano has blown its top and, as you might expect, the media has gone batshit. Even otherwise commendable publications like Nature have lost their heads and are calling Grímsvötn “the new Eyjafjallajökull” (hint: it’s completely different). So here’s a quick look at the key information sources you need to understand what’s going on. Firstly, let’s just talk about pronunciation. Whereas I could understand the reluctance to attempt Eyjafjallajökull, even though it’s not that hard once you’re got your tongue round it, Grímsvötn is much easier. An Icelandic friend says the í is like the ‘ea’ in ‘eating’ and ö is a bit like the e in ‘the’ or the u in ‘duh’ so basically a bit of a schwa. Repeat after me, then: Greamsvuhtn. Easy. Yet despite it being a relatively simple name to pronounce, at least one BBC news presenter bottled it and said something like “A volcano in Iceland” and, instead of tackling Eyjafjallajökull said, “Another volcano in Iceland”… Wimp. Earthquakes: Last 48 hours worth of earthquakes. It’d be awesome if someone captured this and made a nice visualisation. And if you’re missing data, just email and ask them – they’re very nice, as I found out last year when they sent me the archival data for Eyjafjallajökull. The IMO have a lot more data, such as tremor, inflation, and seismic moment, but it will take an expert to interpret that for you. 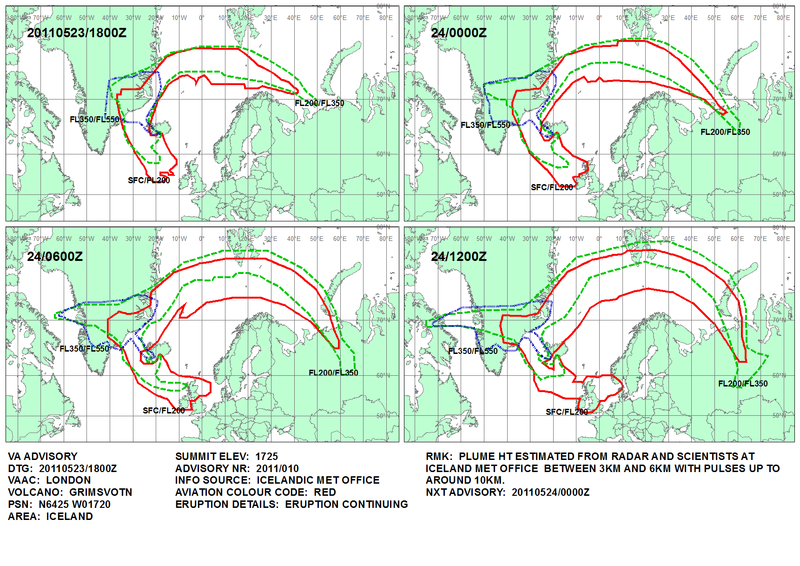 List of Volcanic Ash Advisory Graphics, or VAGs: These graphics are really useful, but they take a bit of interpreting. If you look at the full size version of this, you’ll see more clearly that there are three coloured lines: The blue line is labeled FL350/FL550, the green line is FL200/FL350 and the red line is SCF/FL200. The blue line is the highest part of the ash cloud between FL350 and FL550, i.e. between 35,000 and 55,000 feet. FL means “flight level” and the number is how many hundreds of feet above ground level you’re looking at. The green line is between 20,000 and 35,000 ft, which is about where jets cruise (at 33,000 ft), and the red line is between surface and 20,000 ft. VAGs are produced regularly and include four forecasts at 6 hour intervals. The thing to remember about these VAGs is that they are forecasts based on current volcanic activity and wind forecasts, so they can and do change. At this stage, I’d love to say that the regulators and air traffic control bodies are a great source of info, but they’re not. That’s not going to stop me giving you their links, though. UK Civil Aviation Authority. They also have a Twitter account, but haven’t yet got to grips with the idea of giving people useful information. NATS: The National Air Traffic Services are giving regular updates, but it’s not particularly detailed. I’m pretty sure that the now ‘unofficial’ Twitter account was official this time last year, but either way, NATS should sort out their Twitter presence. EuroControl: The EU air traffic control, also on Twitter, but doing a slightly better job of it. I would like someone to slap the CAA, NATS and to some extent Eurocontrol round the chops and insist that they get their online acts together. They may think they have something better to do than communicate with the public, but frankly, I can’t think what it might be. At times like this, we need informed voices from the organisations making and implementing policy decisions to be communicating directly with the public, to counteract the uninformed nonsense we’re fed by our media. Right now, it’s just one great big mess of fail and it’s very disappointing. If any one of you organisations get in touch with me, I’ll go so far as to give you a discount just to see you actually start to engage properly. Frankly, Erik’s work on the Eruptions blog, gathering links and keeping us up to date with what’s happening, blows all the official sources out of the water. Erik has created an awesome community of people who are constantly on the look out for news and information and sharing it in the comments and, from that smorgasbord, he picks the best links for his posts and provides an expert view on what’s happening as well as some highly accessible explanations. This, to be honest, is the kind of stuff we should be seeing from the UK Met Office, the CAA, NATS and Eurocontrol, not to mention the media. Always a fascinating site, FlightRadar24 has now added an ‘Ash Layer’ which superimposes the current forecasts on to their radar map of all the planes currently in the air. Well worth a peek. Mila have a number of webcams up around Iceland. Currently there’s one working webcam trained on Grímsvötn, and although the picture’s a bit wobbly, when the sun’s up you can clearly see what’s going on. Or not going on: Right now, there’s no plume, but that can of course change at a moment’s notice. All that said, Iceland is volcanically a highly active country and the lull in activity we’ve seen throughout the history of aviation is not something we should be taking for granted. I wouldn’t panic, though. But nor would I believe everything I read in the media.